Hello everyone! 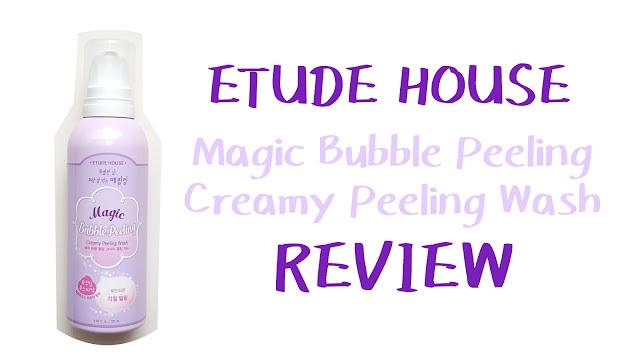 Today's post will be a review of Etude House's Magic Bubble Peeling Gel Creamy Peeling Wash! As you may or may not know, I went to Singapore last month and I bought this product while I was there. 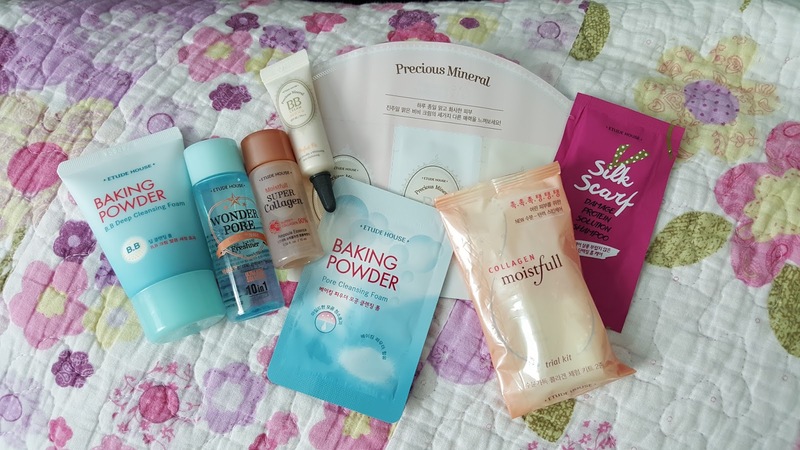 Exfoliation is an important part of the Korean 10-step skincare routine and I've been meaning to get myself an exfoliator. My first option was actually Cure's Natural Aqua Gel (sold at Sasa), but because it's price was RM125, I didn't purchase it (yet, at least). 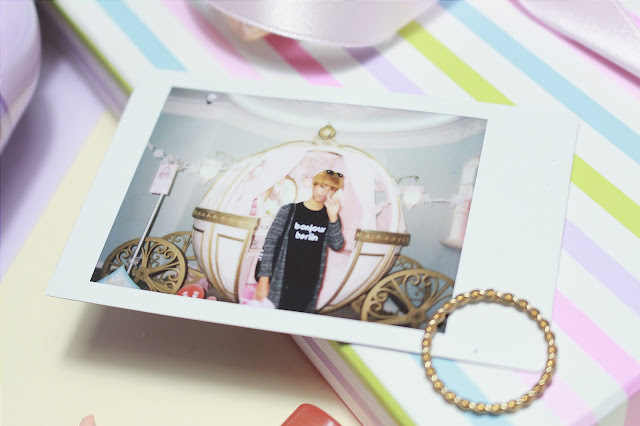 Anyway, I was going through the Etude House outlet in Orchard and came across this product! I decided to give it a try after the salesgirl gave me a quick demo. PS. For the photos in this post, I used some of the Etude House samples that my BFF Sammi gave me ^^ Thanks Sammi! My fab photos would not have been possible without them hahaha. As I mentioned above, exfoliators are a good way to get rid of dead skin cells to speed up your skin's monthly turnover, leaving you with clearer and brighter skin! Our skin is an organ that helps protect us from external factors like dirt and UV rays. The top most layer which is in contact with the rest of the world kind of "dies" and our skin has a natural turnover every 30-40 days. In this turnover, the old "dead" skin cells are removed and are replaced by new skin cells. By washing our face we slowly "peel" through this layer, revealing the new skin. Exfoliators help speed up that monthly turnover, giving us brighter, better looking skin faster. 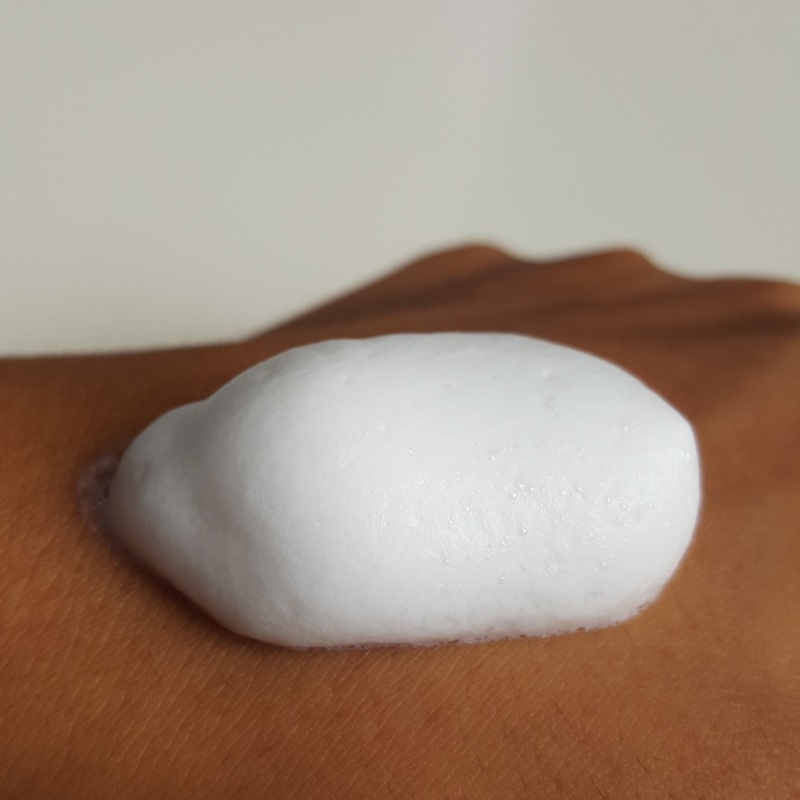 Contrary to normal exfoliators in the market which are cleansers or scrubs with beads, this exfoliator is actually a foam exfoliator which also acts as a cleanser. Similar to the Cure's Natural Aqua Gel Exfoliator, you have to rub it into your skin and your dead skin will roll off just like that! This product promises to leave your skin smooth with a baby soft complexion. It works to eliminate dry, dull surface cells and improve penetration of skincare as well! This product contains Cellulose, Soy Protein, Milk Protein, Black Bean extract, Apple extract and Vitamin E and Lecithin. 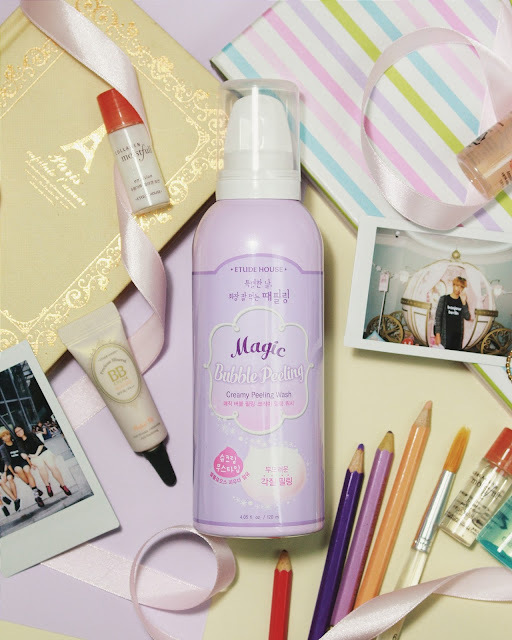 This product is part of Etude House's Magic Bubble Line which also includes the O2 Water Peeling Pack and the Brush Peeling Foam. All three of them have different ingredients but all work to exfoliate the skin. I bought this for SGD19.90 (120ml bottle) in Orchard, which converts to roughly RM60 (half the price of Cure's Aqua Gel!). I searched in the Etude House outlets in Melaka, Ipoh and Penang but so far I haven't found this in store, but all three places do have the Brush Peeling Brush. I read other reviews online and some people reportedly bought this in KL for RM59.90, which is almost the same price of which I bought it. 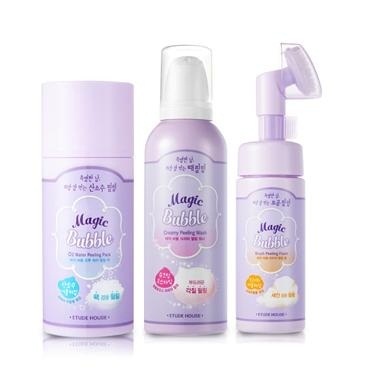 It costs RM34.90 on (Seoul-Next-By-You, koreansbymalaysia.com) and is currently not available on Hermo.my. 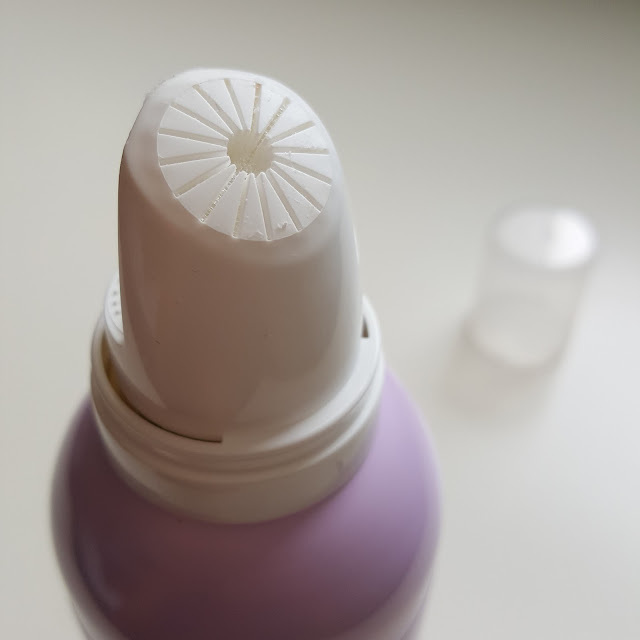 The product come in metal bottles with a nozzle, similar to whip cream bottles. New bottles come cling wrapped. 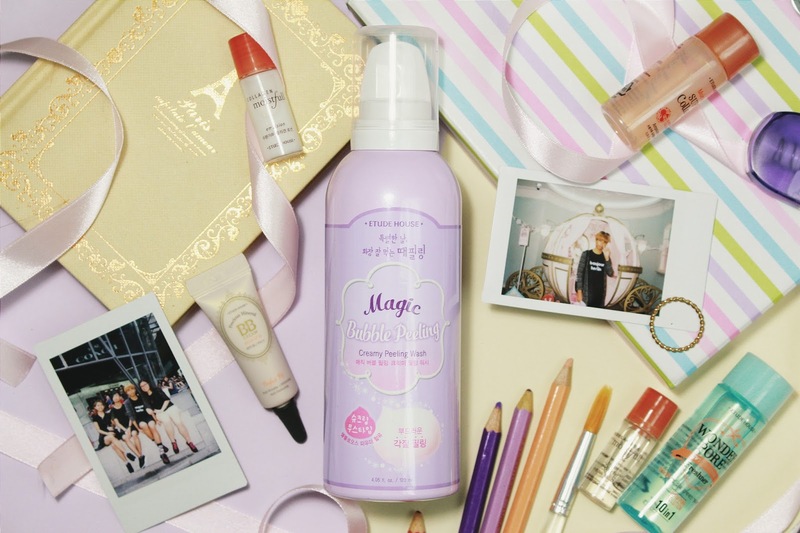 The bottle looks sooooo cute in purple and as I said in previous posts, Etude shall always will in packaging! 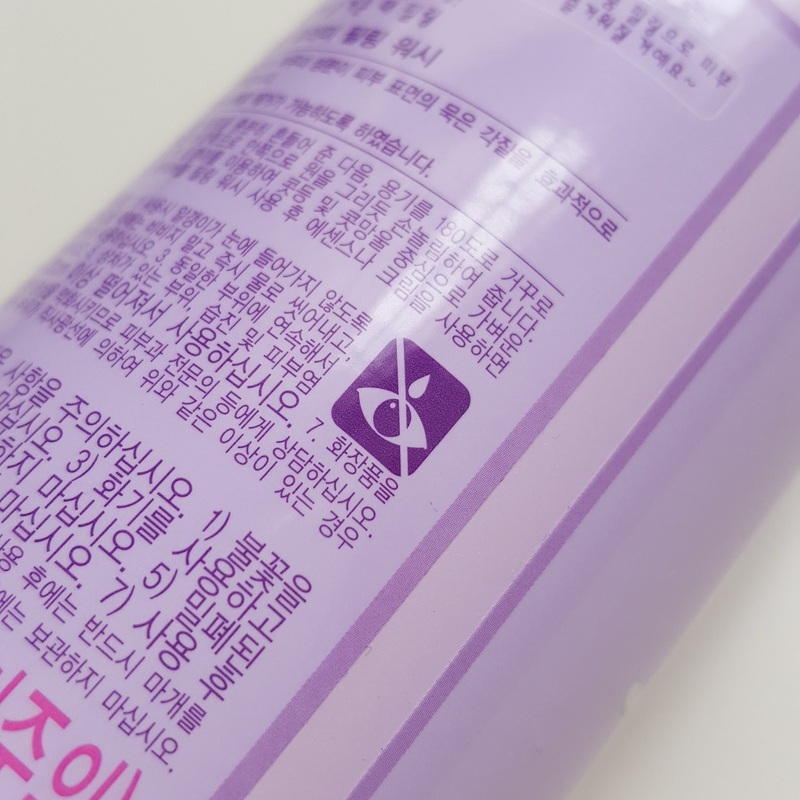 On the back, there is a warning to not apply the product on your eye area and to keep this product away from fire as it is LPG flammable. The nozzle needs to be pressed to get the product out. This product is formulated Cellulose powder with active enzymes, Soy Protein & Milk Protein with protease (which is a mild exfoliant), Black Bean extract, Apple extract and Vitamin E and Lecithin (which work to promote skin vitality and replenish it as well). 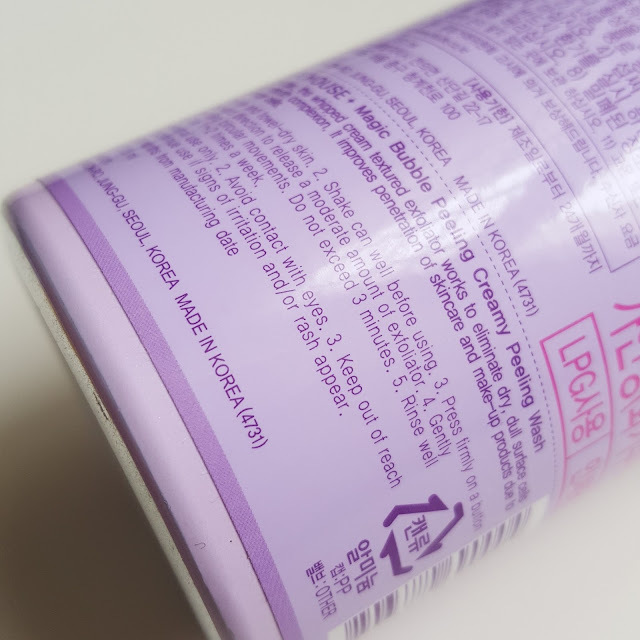 This product has a white foam consistency that when NOT rubbed, leaves to dry to a sticky film-like consistency. It kind of smells like a cleanser with a slight milk scent. 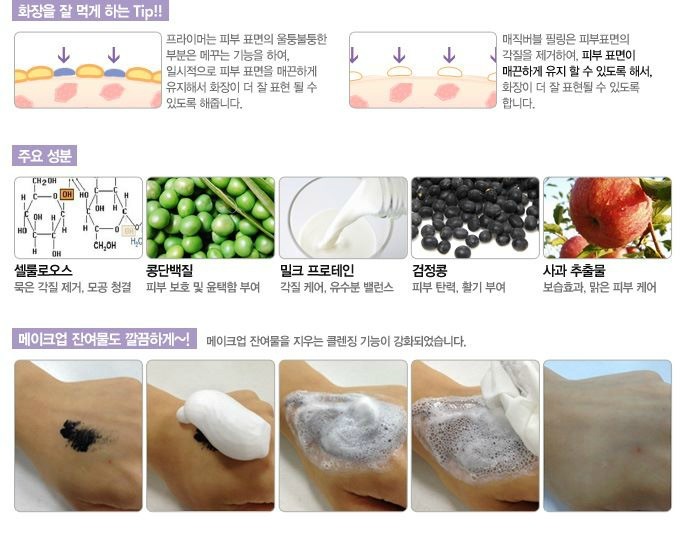 After rubbing, the dead skin/product become white particles that should be washed off. 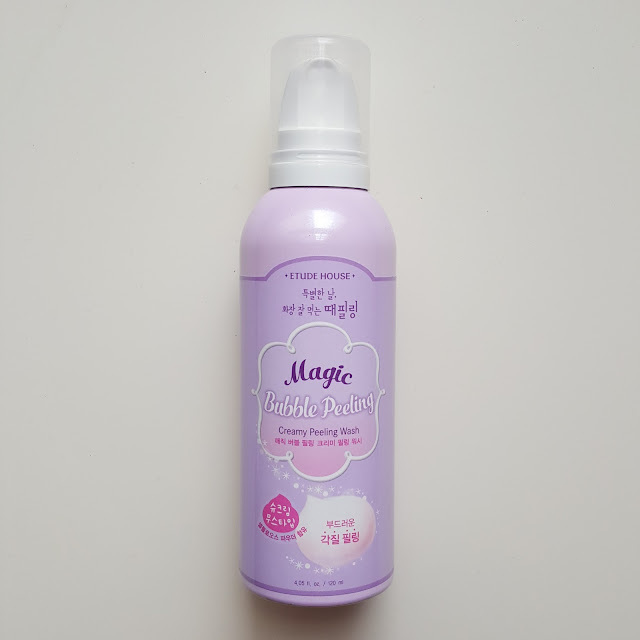 I usually use this product after cleanser and before toner/essence/lotion. 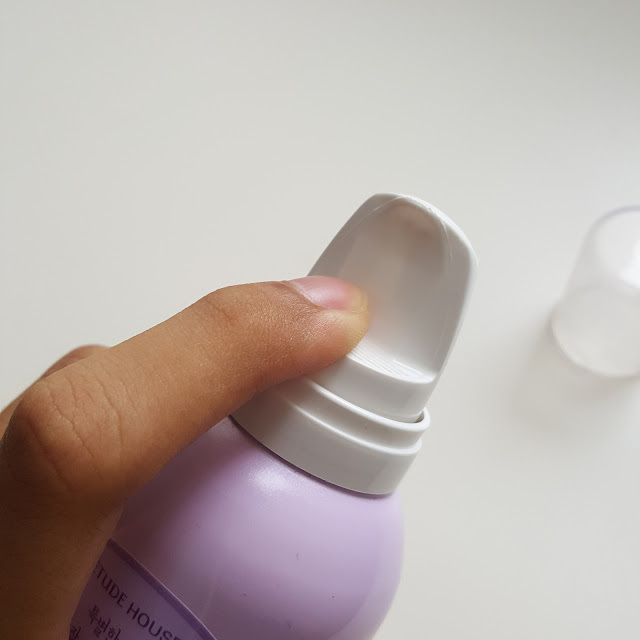 After washing your face and wiping off the water with a cotton pad, shake the bottle a few times and press the nozzle onto the back of your palm. 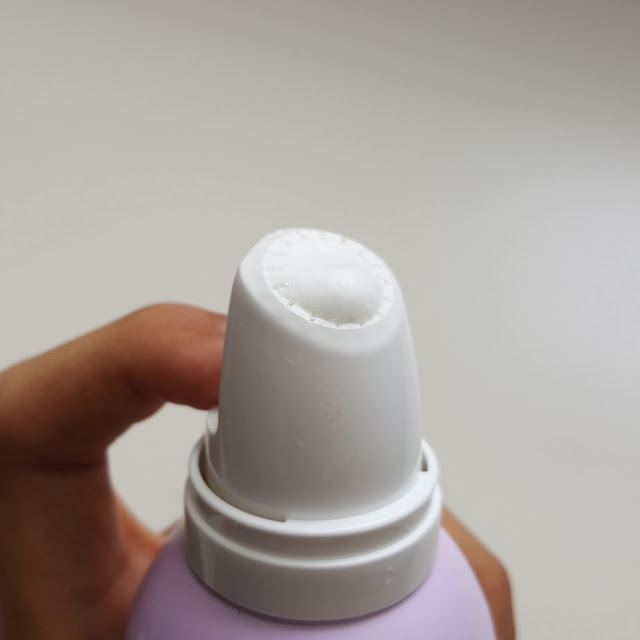 A single press of the nozzle usually releases a line of foam, which is enough for half of your face. Use your fingers to apply the product to your face and rub it in a circular motion until the foam solidifies. The official tutorial shows the lady putting on a lot of foam onto her face but too much foam actually makes it a bit hard to rub the foam into a solid. All you need it a thin cover. You really have to shake it well and press the nozzle well, if not the product will not come out as a foam but as a liquid. My first doubt about this was if it was really dead skin that I wash off in the end or it just the product making it seem that there is dead skin. The answer is BOTH. I used it twice and although I used the same amount: the first time had more dead skin and solidified product. ON the second time there was less solids formed and they were basically just the product which solidified. So yes, this product works. It left my skin feeling very soft indeed! It didn't exfoliate my skin as mush as I thought it was going to, but it did gently exfoliate my skin. It can't really get rid of blackheads very well, but it can get rid of dull dead skin, leaving your skin not a shade lighter immediately, but cleaner and softer. I don't love this product, but I do like it. This definitely made my skin smoother/softer and helped my skincare products get absorbed better. 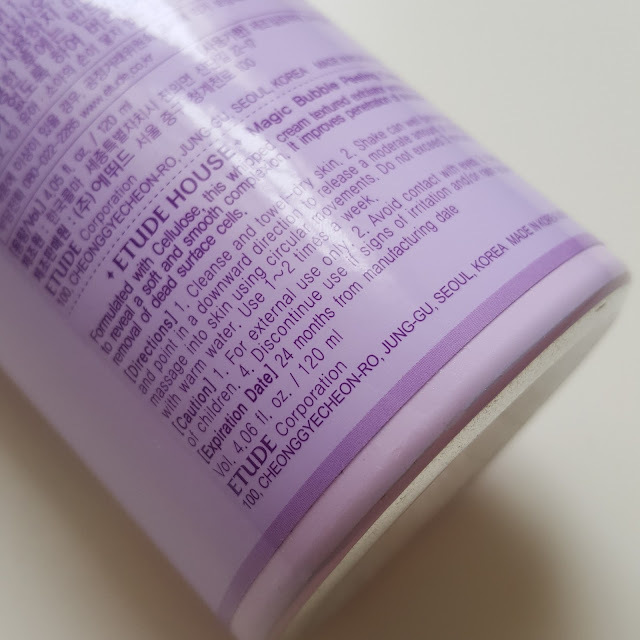 The Cure Aqua Gel's solids were kinda gray in colour so it was kind of obvious that it was dead skin cells. 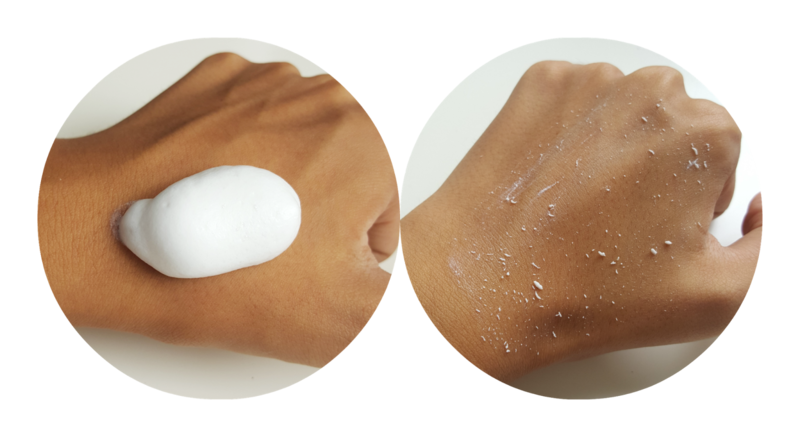 With this product, all the solids are white like the foam, but it does get rid of dead skin. Its a gentle exfoliator that gets the job done. Plus the slight scent stays for a while and I find it really pleasant. I probably wouldn't just because I really want to try Cure's Aqua Gel, but I did like this product. Plus it's affordable! If I run out of options, I wouldn't mind coming back to this. And that's the end of this review! If you're interested in reading more of my skincare product reviews, click here!